Enercon Plasma surface treatment helps leading automotive manufacturers reduce cost, achieve light weighting, and improve surface adhesion prior to gluing, painting, coating and printing on metallic and polymer surfaces. Surface treating is often required when painting plastic parts, such as bumpers and dashboards, and for adding a protective coating to sections that suffer from exposure to the elements. It is also ideal for improving the bond strength of adhesives used in head lamp assemblies, gaskets, mirrors and filters. This surface treatment was traditionally achieved either with hazardous chemical cleaners, primers and solvent materials. Plasma treatment which uses a stream of high energy ions produced from compressed air and electricity is a much cleaner process, reducing the environmental hazards in the factory. And it can be used inline meaning fewer pinch points in the manufacturing process. It can be used on virtually every part of a vehicle from the bumper to push buttons, boot linings to light fittings. In fact, in-line atmospheric plasma treatment technology is most used within this industry. Plasma treatment is effective on glass, metals, composites and polymer materials such as PE, PP, TPO, POM, PUR, ABS, ASA, PA, Nylon, PC, PET and PTFE. Automotive component manufacturers rely on atmospheric plasma and flame plasma surface treatment to clean, etch and functionalize surfaces to increase productivity, improve product quality and reduce cost. This 60-minute webinar provides insights into how treatment improves adhesion for assembling, bonding, painting, coating, printing, decorating, - and deflashing, on a wide variety of surfaces. 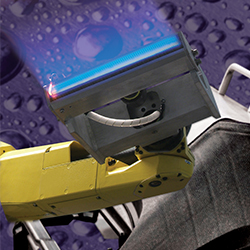 Automotive component manufacturers rely on atmospheric plasma and flame plasma surface treatment to clean, etch and functionalize surfaces to increase productivity, improve product quality and reduce cost.This 60-minute webinar provides insights into how treatment improves adhesion for assembling, bonding, painting, coating, printing, decorating, – and deflashing, on a wide variety of surfaces. TA Systems specialise in custom automation systems for the Automotive industry. They needed to improve the adhesive bonding of instrument panels. Read to find out how they did it. Hella Australia Pty Ltd. designs and manufactures automotive lighting equipment, plastic mouldings, and accessories for the most sophisticated new cars in the world. Hella needed to improve adhesion on a glue track for a new Toyota headlamp. Read how they did it.